It’s a sponge life for me! I am currently in the middle of my ninth week as a placement student with MBERC, the Marine Biology and Ecology Research Centre (specifically, working with DeepSeaCRU), Plymouth University. One of my tasks while on placement is to identify some of the sponges brought back from DeepSeaCRUs expedition to the deep North Atlantic in 2015 (CE15011). Although I have always been interested in the deep sea, sponges weren’t at the forefront of my mind; I definitely didn’t come to university and think “I will do anything it takes to work with sponges”. And yet here I am, working with the Phylum Porifera (The latin name for sponges!). Sponges are usually classified into one of four groups; Calcaera, Demospongae, Hexactadinellida (Figure 1) or Homoscleromorpha. All sponges are composed of spicules, tiny, interlocking formations of various shapes and design which provide structural support to the spongin (sponge tissues, similar to the way in which bones support our skin). The spicules in the four different groups of sponges are formed from different materials. Most sponges found in the deep sea are Hexactinellids, or Glass Sponges. As the name suggests, their spicules are glass-like, and these sponges pull silicon from the ocean and incorporate it into their structure. Spicules come in many shapes and sizes, and different types of spicule are found in different abundances in different parts of the sponge. The type, position and number of spicules are what we use to identify different sponge species. So, several tissue samples from different places on each sponge specimen must be taken in order to identify them. Some of the cutting types taken include; Atrialia (thin section from the inside of the sponge), Dermalia (from the outside), Prostalia; basalia (from the bottom,or rooting spicules), Prostalia; pleuralia (any spicules with stand out from the dermal surface) and Prostalia; marginalia (spicules from around the osculum) (Figure 2). Once I have taken the appropriate (small) cuttings and placed them in carefully labelled Eppendorftubes (Figure 3), I can begin the process of separating out the glass spicules from the sponge tissues. This is done by putting the tissue in sodium hypochlorite, or household bleach. Next, the bleach is pipetted off and replaced with water. Once the spicules have had time to settle, the water is replaced again until most, if not all of the bleach has been removed. The final wash is with ethanol, which is again pipetted off to enable the spicules to dry properly, before they are mounted onto slides (again, carefully labelled) and identification can begin. Using the taxonomic key Systema Porifera, (Hooper et al., 2002), a very, very large book, I can flick straight through to Class Hexactinellida (already looking less scary) for most of my sponges (I think one may be a Demosponge, which is an entirely different story!). From here, I need to determine what family the sponges I have are from. 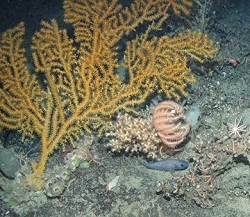 Due to the lack of accessibility and therefore research into the deep sea, there are many undescribed, and even undiscovered species of sponges. Hyalonematidae is the only family which is further separated into subgenera (currently, there are twelve). Getting from Family to Genus level of identification is difficult at first, but becomes more manageable as you get to grips with what you’re looking at, this is where the different spicules really come into their own. Moving from Genus to Species is the most difficult part of identification, as it is with any organism, except with sponges it becomes much more challenging and is the part that I have yet to get to grips with. In order to identify them properly, the spicule length and width, and in some cases the width of one feature in proportion to another, or the total length of the spicule needs to be measured (Figure 4). One of the most challenging aspects has been getting to grips with the language used in sponge taxonomy. It took a while pouring over the sponge ‘Bible’, Systema Porifera, but thankfully, hexactines, ambuncinates and pinular pentactines, are now types of spicules, not just a collection of letters thrown together in an attempt to confuse the unsuspecting scientist! I see spicules everywhere now. Some days, I wake up and my hair looks like a new type of diactin, other days, I look at my computer screen and see the odd macramphidisc (Figure 5) floating lazily across the screen! All in all, I am very much enjoying the placement, and looking forward to my final five weeks. I hope to be able to come back and work with DeepSeaCRU in the future! Hoop er, J. Soest, R. and Willenz, P. (2002). Systema Porifera. 1st ed. New York: Kluwer Academic/Plenum Publishers. Sims, D. (2007). Advances in Marine Biology, Volume 52. 1st ed. Amsterdam: Academic Press.